The Costa del Sol is situated in between the Costa de la Luz and the Costa Tropical, and includes the city of Malaga and the towns of Marbella, Benalmadena, Torremolinos, Fuengirola, Mijas, San Pedro de Alcantara, Estepona, Manilva, Sotogrande, San Roque, La Linea de la Concepcion, Velez-Malaga, Rincon de la Victoria, Nerja and Torrox. The Costa del Sol is a very popular holiday destination, with over 300 sunny days every year and mild winters. With Malaga Airport Transfers you can book a taxi from Malaga Airport to your holiday destination on the Costa del Sol, whether you're talking about small groups or big groups and from small cars to luxury cars and coaches. Hire a private taxi or request a taxi from Malaga Airport using the "Get at Quote" box on the top of this page. The Costa del Sol attracts many of its visitors because of a combination of its year-round sunny weather and the sheer quantity of things to do. 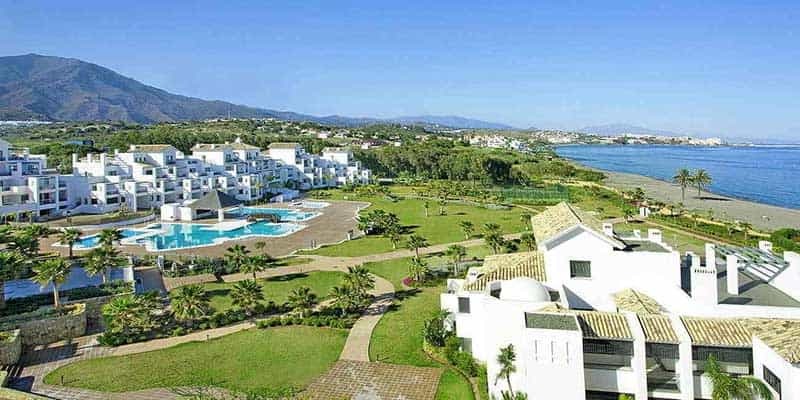 Golf: along the Costa del Sol - also called by some "Costa del Golf" - you will find about 30 golf courses; due to the fine weather you can play a round of golf nearly all year-round. Watersports: the Costa del Sol is a heaven for watersports fans; you can practice sports such as sailing, windsurfing, water-skiing, fishing and many more. Beaches: there is about 160 km of coastline, mostly made up of sandy or shingle beaches, where you can relax or go for a swim. The beaches of the Costa del Sol are usually carefully maintained, cleaned regularly and have lifeguards. Whale and dolphin watching: The strait of Gibraltar has a large population of whales and dolphins. Dolphin and whale watching excursions are available at most towns on the coast. Theme parks: on the Costa del Sol you will find numerous theme parks such as: Aqualand Torremolinos, another aqua Park in Mijas Costa, Tivoli (amusement park), Selwo Marina (Benalmadena), Selwo Adventure (Estepona), Crocodile Park (Torremolinos) and many more. Shopping: you will find thousands of different shops in the coastal towns, but also big shopping centres where you can shop and eat or have a drink. Nightlife: countless bars and discos, usually open till late, can be found in all the major towns on the Costa del Sol. Flamenco and horse shows: to get a real Andalucian feeling, visit one of the flamenco or horse shows; brochures about locations and starting times are available at all tourist information offices. Markets: every day of the week there are markets on the Costa del Sol. Weekly flea markets, for example, gather on Saturdays in Fuengirola and Sundays in Torremolinos. Festivals: we have lost count of how many festivals there are, but some say they may number as many as 3000 during the year. And whether they're religious, or to celebrate the orange crop, or whatever the reason is, the end result is always the same: music, dancing, drinking and eating, and of course loads of fun! The local fairs (Ferias) are celebrated in between April-October with plenty to keep the children busy and peñas (bars where you can eat and drink and listen to live music) for adults and families. Marbella: luxury shopping, dining and the port town of Puerto Banus. Nerja: The best beaches and a charming old town. Mijas: donkey taxis and lovely people. Ronda: culture and historic monuments. Fuengirola: shopping, walks along the beach promenade and nightlife. Malaga: art, culture, history and monuments.